Every year, here in Germany, they go wild about spargel. 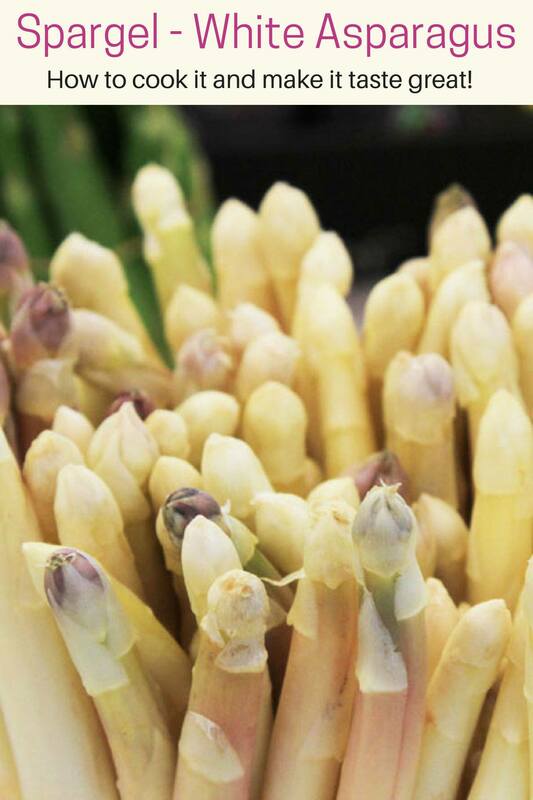 What is spargel? White gold…er, um, I mean white asparagus. Pulled from a protective row of soil, never having seen the light of day, this delectable veggie comes out a pretty cream color. 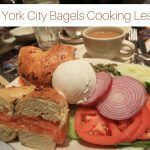 We love it, and we think you will to, so we’re going to tell you how to buy it, prepare it, peel it, cook it, and put it into one fantastic recipe. White asparagus will be forever on your menu, that’s for sure. 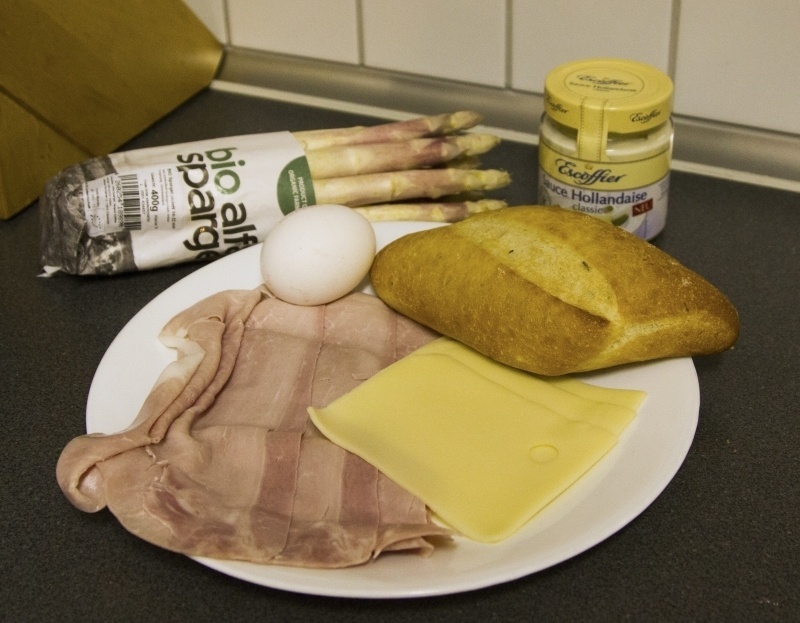 Why is White Asparagus or Spargel so Popular? Spargel, or better known as white asparagus. In the spring it might as well be called “white gold.” It’s that important to connoisseurs all over Germany. 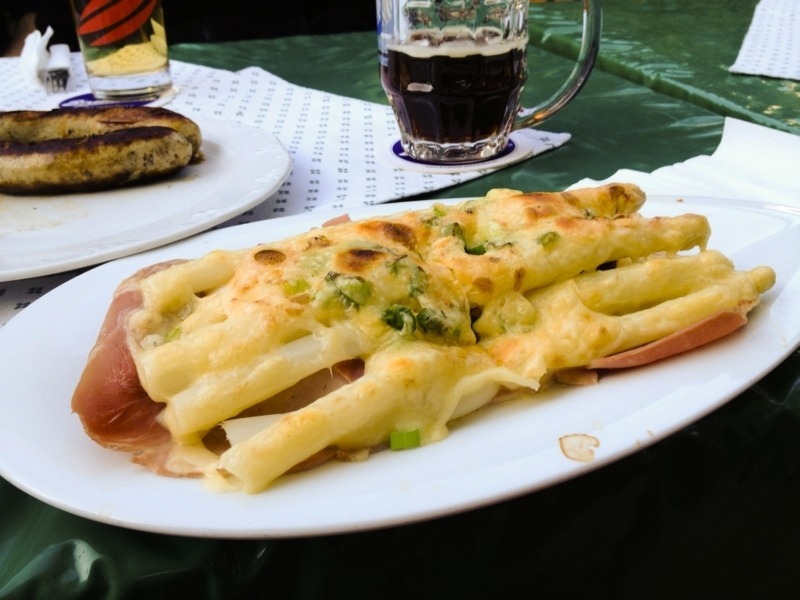 Spargel, or white asparagus, is a little different than its green counterpart, and the Germans are big fans. You know how the green asparagus can have an almost bitter flavor sometimes? You never get that with the white. It’s a milder, more subtle taste, and people of all ages just love it. Instead of growing it above ground, it is grown in large rows, with soil heaped over the plants, then covered with a black plastic. It is usually harvested from mid-April to mid-June, but some years it comes in later, depending on how bad the winter was. As the season begins, you will see all the restaurants jumping on the spargel wagon, creating entire menus based around this much sought-after veg. 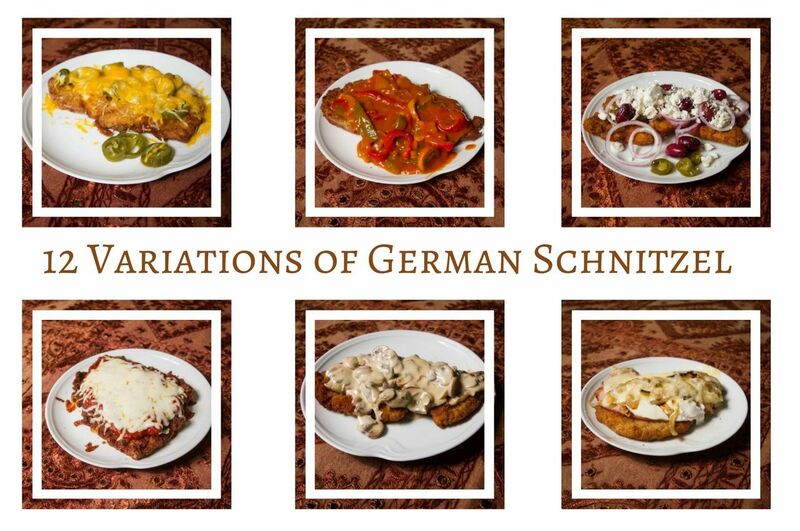 The two most traditional ways of serving it is either boiled and served alongside boiled potatoes and ham, sometimes with the Hollandaise sauce, or in Spargelcremesuppe (white asparagus soup), which is by far Jim’s favorite. Nowadays, however, the chefs are trying to come up with new ways to serve spargel and wrangle your business to their restaurant. The spargel menu usually will have a number of meats or salmon served with the potatoes and white asparagus for a few options. 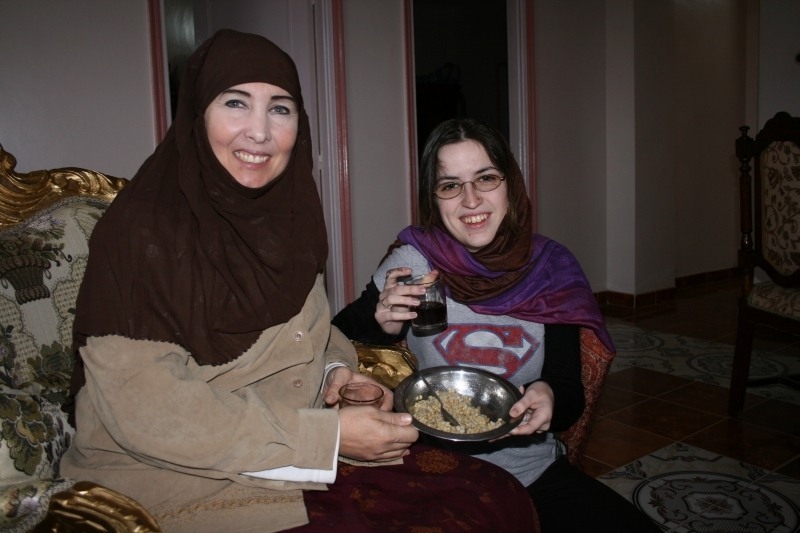 Then they often will have one really new dish to entice you. At one place I had a toast with a chicken breast, ham, cheese, and mustard and cream sauce to top it off. I haven’t been able to find it since…unfortunately. 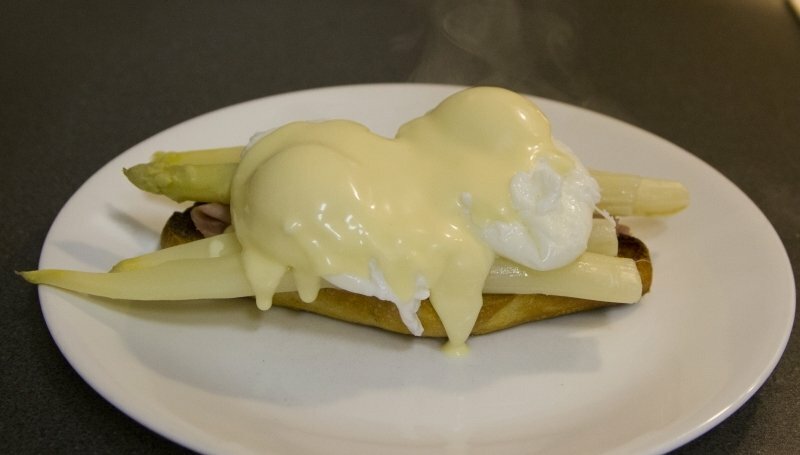 Pin How to Cook Spargel, then go out and buy some to try this white asparagus recipe. In Germany as well as many European countries, white asparagus can be bought in any grocery store or local market during the season. However, the very best place to buy them is right at the field where it’s grown. The farmer or coop will set up a stand and they will sell it right then and there. Most stands will even peel it for you, because it should be done just the right way. We never buy ours peeled, because we may or may not get side-tracked and not make it that night. If you peel it, you need to use it right away. Beautiful and elegant, the taste of white asparagus is pure and subtle. here it is being offered at a local market. Buy it quick; it won’t last long. In the U.S. fresh white asparagus is a bit harder to find, but it’s becoming more and more popular. Most Whole Foods, or other specialty and gourmet grocers will stock white asparagus. When you look at the price tag, you’ll see why I call it “white gold.” It’s expensive, bu,t as we’ve mentioned, once you’ve had it, it’s easy to get addicted to this luxury vegetable. You can buy a canned version pretty much all year long. We do use that, especially as a pizza topping, but of course you are better off using fresh if you can find it. As you peel the outer skin, you can see and feel the difference. White asparagus has a tougher structure than the green variety. Therefore, you must peel off the outside layer or it just tastes like bark. If you buy it at a market stall, many times the vendor will offer to peel it for you. This is a good idea if you plan on cooking it right away, but if you are like us, and it’s going to stay in the fridge until you get a chance to cook, you might want to peel it yourself. 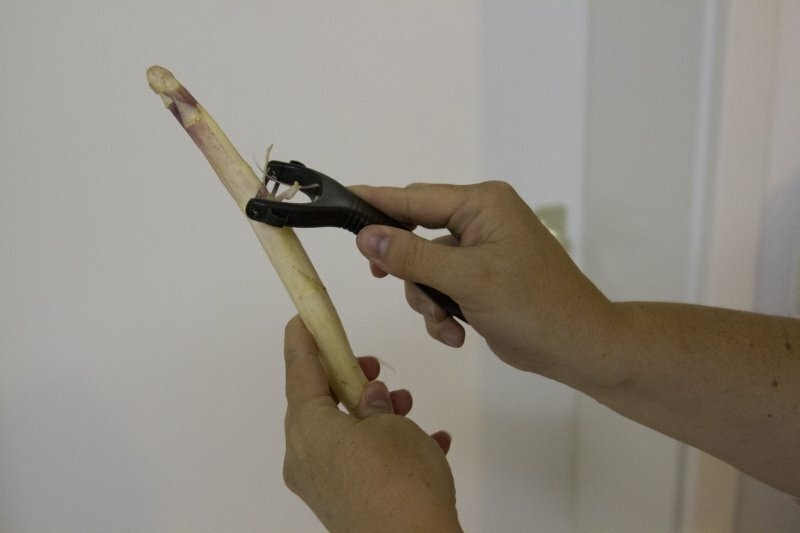 Take a vegetable peeler, and trim the outer skin. Power Tip: If you are making a soup stock, the peelings from the spargel will add a nice taste. Just remember to drain it when finished. You won’t want to eat the outer stalk. It’s just too hard to chew. White asparagus is very hardy. It has to be to thrive under a foot of soil, so it’s imperative to boil it for at least 7-10 minutes (my preference is about 15 minutes) before including it in a recipe. If you just want to butter it and serve it as a side dish, then you are finished. However, many of my recipes call for it to do more. 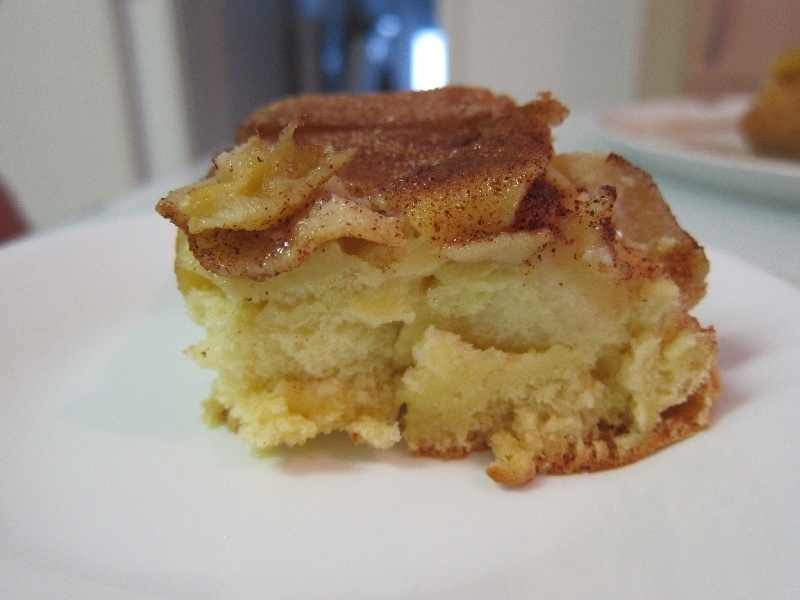 Once it has been softened, it’s cooked, but you can grill it or bake it a little more if you need to. It also needs to be boiled, again to get some of the hardness out of it. We parboiled ours for about 15 minutes. We’ve had white asparagus in so many different ways, from soups to sandwiches, casseroles, and more. It really is versatile. The real trick is not to overpower the subtle taste of it. 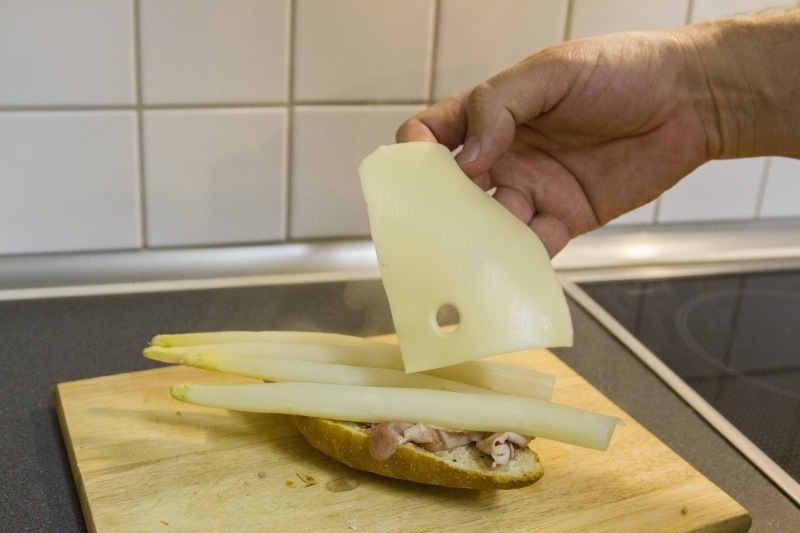 This is a popular way of serving white asparagus; on toast with ham, broccoli, and with a mild cheese grilled and melted. 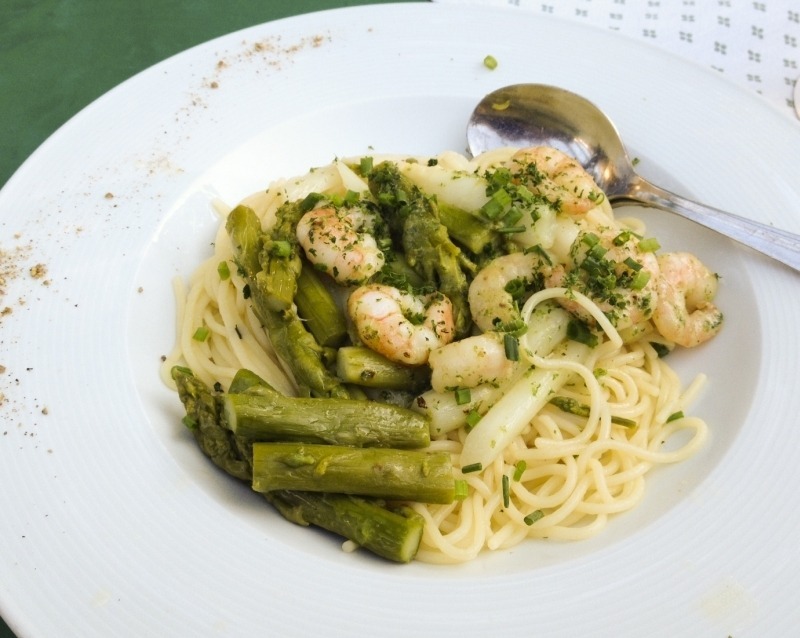 Green and white asparagus (spargel) are mixed with prawns for this pasta dish. No recipe needed for this spargel. 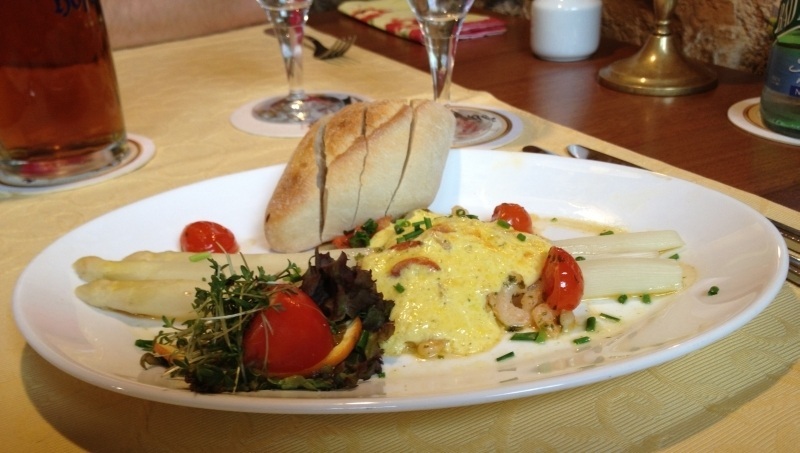 It’s simply a few stalks of white asparagus under a layer of tomatoes and shrimp, and covered with Hollandaise sauce. 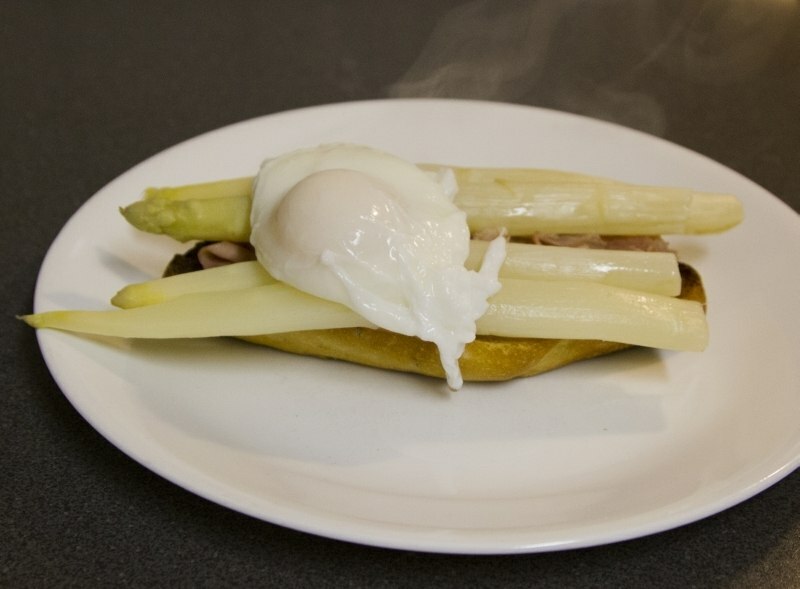 We love a toasted sandwich with a creamy, poached egg on top, so we created this recipe to celebrate during spargel season. Ingredients for our own brunch toasted spargel recipe. The best thing about preparing sandwiches is there is no wrong way to do it. For our brunch, we just had the ingredients ready, and then each guest stacked their own, using the ingredients and amounts they liked. Some folks didn’t want the eggs, which was fine. 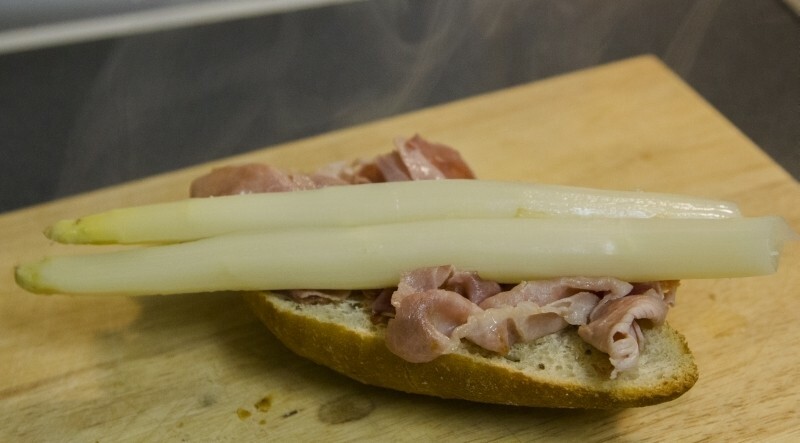 The original sandwich we’d had in some cafes just serve it with ham and sauce. It’s good, but in my opinion those eggs push it over the top! Even with the peeling and the boiling, and the having no real idea what we were doing, both dishes were quite quick to make. 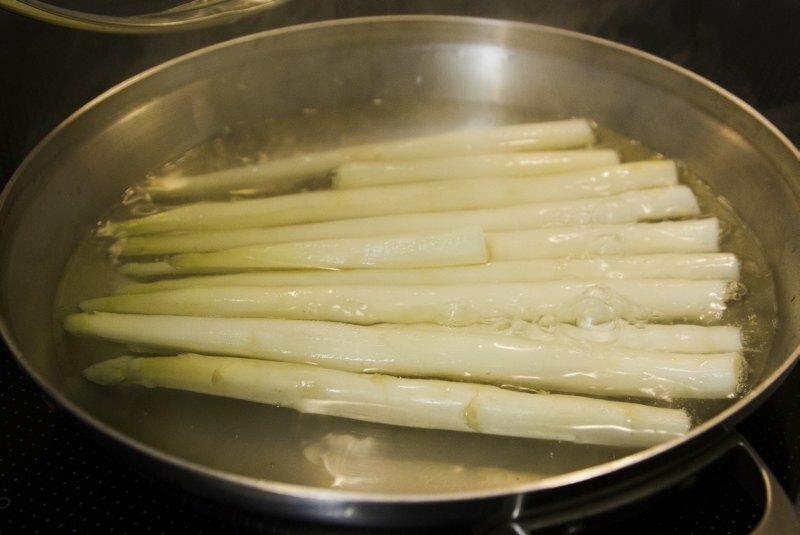 If you boiled your spargel ahead of time, then it wouldn’t take more than 10 minutes, but with the boiling, you’re up to half an hour. 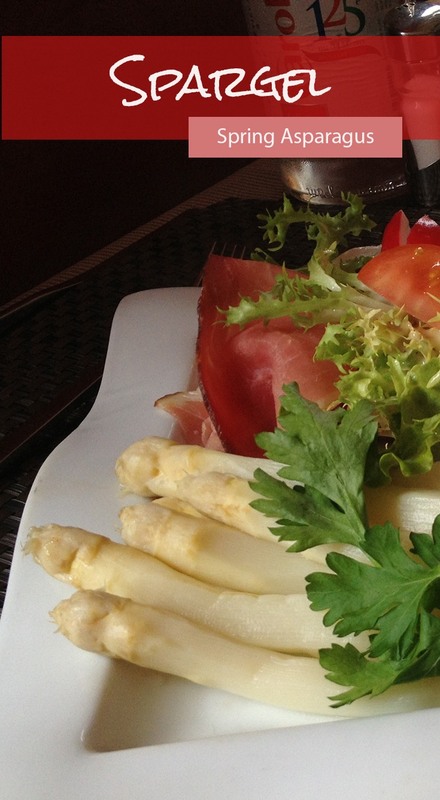 Have you ever had white asparagus? Or would you rather just stick with the traditional green asparagus? What’s your favorite asparagus recipe? Don’t forget to pin our spargel recipe for later. 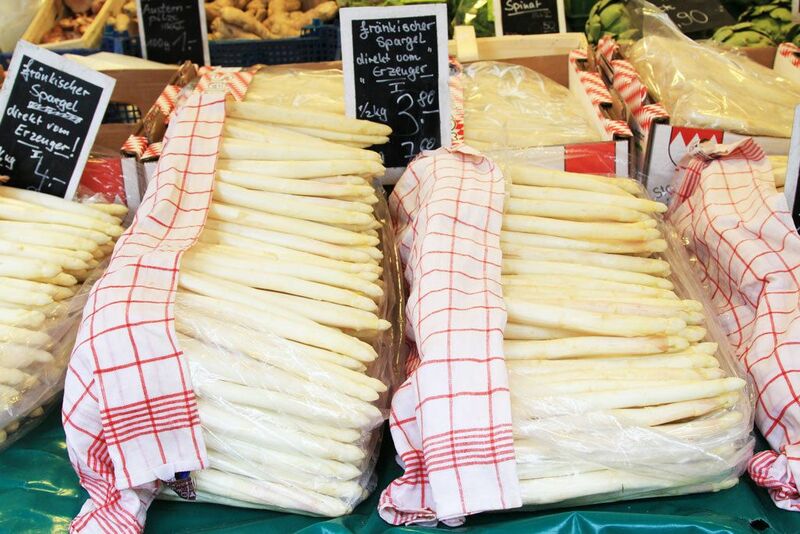 I must say that I was in Germany during spargel season and it’s true – the locals go crazy for the white asparagus. Until now, I didn’t realise what it was and that it is seasonal. I had some and it was good.